The purpose of this chapter is to assemble a theoretical toolkit, a greedy bag of possibilities, that can enable childhood-nature encounters to flourish in the Anthropocene and beyond. In this undertaking, our aim is not to put diverse theoretical perspectives into competition with each other but rather to assemble theories as tools which can produce sparks when knocked together. These are theories that can be packed up and taken for a walk. Theories that can help us to get out of sticky situations. And theories which children themselves can use to address the crises which they will inevitably inherit (and already are). As such, this theory-infused section seeks to put multiple philosophical perspectives into consequential relations such that they can become productive in their directions and differences. In this chapter we take stock of theories that have been productive in the field childhood-nature up to this point, while at the same time seeking new theories, which are emerging in direct response to the contemporary planetary turn. While setting out on an uncertain and tenuous adventure into the future, theories should be available to us and are very much needed to help us respond effectively to what is regarded as rapidly changing conditions of life on earth for all species and things. This is particularly the case in the emerging field of childhoodnature, as children themselves are being forced to grapple with existential threats associated with the onset of the Anthropocene era, including climate change, social instability and water crises, among many others. The purpose of this section is to assemble a theoretical toolkit a greedy bag of possibilities that can enable childhoodnature encounters to flourish in the Anthropocene and beyond. In this undertaking, our aim is not to put diverse theoretical perspectives into competition with each other but rather to assemble theories as tools which can produce sparks when knocked together. These are theories that can be packed up and taken for a walk, theories that can help us to get out of sticky situations, and theories which children themselves can use to address the crises which they will inevitably inherit (and already are). As such, this theory-infused section seeks to put multiple philosophical perspectives into consequential relations such that they can become productive in their directions and differences. This section, and pondering with theory, asks us to take stock of theories that have been productive in the field childhoodnature up to this point however at the same time to seek new theories which are emerging in direct response to the contemporary planetary turn. The questions that authors are asking refer to the natures of the theories of childhoodnature and to the complexities of childhoods in the Anthropocene. We need theories to respond to and challenge the changing conditions of human and nonhuman subjects and of all, mundane, everyday, organic, and inorganic planetary life. Children in the Anthropocene – as Malone (2017) argues – are grappling with this era, as the crisis is real. Children are in the center of the greedy theoretical bag that is required for us to both problematize and establish the field of childhoodnature. 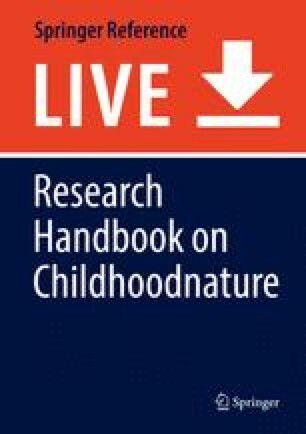 The questions we have asked of the authors, and which the authors in return have asked of themselves, are how childhoodnature theories are becoming the catalyst to move childhoodnature and how they can capitalize on difference. Contemporary posthumanist and new relational materialist theories, which figure prominently throughout this section, critique the value of human/nature binaries and the limits they place on how we come to understand what it means to be human, not as outside of the world but deeply entangled with all that makes up the human and more than human world. In this world of new materialist/posthumanist theories, creativity and agency will still exist, but they will no longer be positioned as the property of humans alone (Chandler 2013). Rather agency, and in this case children’s agency when responding to the ecological crisis, will be recognized as assemblages, associations, and relationships through which they are wordly with a host of other species and entities. By moving away from an explanation of children’s environmental encounters from a humanist perspective where we “…understand and act in the world on the basis of our separation from it – articulated in the constraining, alienating and resentment-filled modernist divides of human/nature, subject/object, culture, environment,” a posthumanist approach allows a consideration of how we “should develop our understandings around our attachment to the world” (Chandler 2013, p. 516). That means shifting away from the child in nature as the only agential body and focusing on the materiality of child bodies and the bodies of other nonhuman entities as relational assemblages to allow a new ethical and theoretical imagining for children and their encounters with place and nature. This focus on shifting away from a romanticized or humanistic view of the human/nature relationship has been a feature of scholarship in a range of disciplines evolving over many years/centuries (Head 2016; Duhn, Malone, & Tesar, 2017). So even though they feel fresh, their ontology can be traced back to a range of theoretical approaches – philosophical thoughts – of philosophers such as Spinoza, Derrida (2005), Deleuze and Guattari (1987/2014), and many more (see Murris in this section for a mapping of this cartography of human/nature theorizing). Unfortunately, over this time, many of the disciplines – where these ideas have had the least currency and still remain in many ways uncontested – are disciplines that have been very influential in the children’s environments, childhood studies, child/nature, and children/cities research fields. Disciplines, such as environmental education, childhood sociology, urban planning and urban studies, landscape architecture, and environmental psychology, have been slow on the uptake of working with contesting human/culture binaries and contest human exceptionalism in particular. Thus, the outcome has been a strong human-centric and deterministic paradigm that has been influential in the conception of the childhood – nature field. While there has been some leverage through theories such as biophilia (reference) and affordance theory (ref), the theoretical work has mostly been narrowly focused on sociocultural frameworks solely attentive to human-centric agendas. The main exception to this has been in geography, with many urban, human, and cultural geographers who have been interested in children and environments applying these theoretical approaches in their research. The journal Children’s Geographies, for example, has encouraged and has, over a long period of time, been publishing articles in which authors have engaged in a range of theoretical approaches including posthumanist and new relational materialist theories, and many other cutting-edge theoretical thinking, in their research. The theory section of this handbook therefore becomes a significant moment for attending to and noticing how and what theorizing in childhoodnature is influencing the field and, to paraphrase Haraway (2011), what stories are making worlds and what worlds are making stories. This section tells some of these theories and philosophies of childhoodnature stories. However, theories are not captured or sealed in a tight container of science. There is always some spillage. So theories and philosophies of childhoodnature do spill over, and they are both a liberation and a shift; and they are perceived as a possibility to engage with others. Such philosophies of childhoodnature primordially attest to that notion and thus speak back to Haraway’s statement above. Furthermore, in such a way, childhoodnature is the world of children’s lived experience, a physical world not so much indifferent since they are personally bound to it with their love, hatred, relations, contempt, respect, narratives, tradition, nature, and culture. In this tradition, conceptions of “nature” and “culture” are conceived as theories with children. There are these realms of childhoodnature as inimitable, inalienable, and nontransferable notions of children’s relations. At the basis of this planetary experience and childhoodnature relations are values which are simply there, perennially, before children ever speak of them and before they reflect upon them and inquire about them. Childhoodnature theories function in this section as if there is a rational understanding at our grasp but at the same time of the hidden source of all the rules, customs, commandments, prohibitions, and norms that hold within it. The natural world, by virtue of its very being, bears within it the presupposition of the absolute which grounds, delimits, animates, and directs it, without which it would be unthinkable, absurd, and superfluous and which we can only quietly respect. Any attempt to spurn it, master it, or replace it with something else appears, within the framework of the natural world, as an expression of hubris for which humans must pay a heavy price. Based upon this thinking, by initiating this section, the editors invited authors to engage in a variety of theoretical responses which would open up the potential theoretical landscapes of childhoodnature as samenesses and differences. There was no sense of what those theories had to be other than that they should be disruptive of set ways of knowing and thinking that set up dichotomous relations between human subjects and nature. We advised that potential guiding theoretical papers could include but were not limited to sociocultural theory, poststructuralism, posthumanism, systems thinking, postcolonial theory, ecoexistentialism, and eco-psychology. From this call, we received a number of chapters that are part of this section. These have been grouped under the key conceptual headings (loose containers) of diffractive and speculative theorizing, posthuman and new materialist theories of learning, and theorizing through place. Murris engages with diffractive theorizing to provide a cartography of western thought and engages with the key concepts of culture/nature. She acknowledges the role of feminist scholarship in order to understand that the dominant concept of knowledge in education is grounded in both the nature/culture dichotomy and in patriarchy. The knowing subject, man, is assumed to be of a particular (adult) age. Modern schooling positions children as knowledge consumers, not producers, because it is assumed that they are (still) developing, (still) innocent, (still) fragile, (still) immature, (still) irrational, and so forth. In her chapter, she shows how six overlapping configurations of child presuppose the metaphysical nature/culture binary which have shaped schooling as a process of becoming adult (man): the “developing child,” the “ignorant child,” the “evil child,” the “innocent child,” the “egocentric child,” and the “fragile child.” The figuration of the “normal” knowing subject informs institutionalized discriminatory and colonizing child-adult relationships and has brought into existence specific roles of the educator: guide, instructor, trainer, discipliner, facilitator, socializer, protector, diagnozer, or medicator. Drawing on the philosophies of Barad, Braidotti, Haraway, and Deleuze, the chapter by Murris unhinges child and childhoods from their metaphysical frame of reference. For “justice to come” (Barad, 2012, p. 81), she argues schooling needs to contribute to a postcolonial future that disrupts human exceptionalism and age-discrimination. Moving beyond the anthropocentric focus on children’s abilities or capacities as individuals, such posthuman schooling would regard knowledge production as part of an ontological relationality (including nature and culture) through which the human and more than human render each other able (Haraway, 2016). Drawing on posthuman notions of space and time, she offers tentative imaginaries of a diffractive posthuman educator. Weaving her personal narrative and a cartography of the theoretical field of childhoodnature, Malone’s chapter is a biographical account of being and becoming an environmental educator and researcher in the field of childhoodnature over and through 25 years. Also borrowing from Barad (2014), she uses the notion of a “diffractive turn”: “…by re-turning – not by returning as in reflecting on or going back to a past that was, but re-turning as in turning it over and over again – iteratively intra-acting, re-diffracting, diffracting anew, in the making of new temporalities (spacetimematterings), new diffraction patterns” (Barad, 2014, p. 168). Barad (2014) attributes the notion of diffraction as evolving from feminist theorizing and the science discipline of physics, both seeking to deepen understandings about difference differently. Diffraction is a useful and troubling process, and unlike the idea of reflecting on stories, she views her research as entangled in many worlds. Over and over, spanning a series of theoretical returns from ecophilosophy, environmental activitism, feminist theory, critical theory, human geography, social cultural theory, and more recently posthumanist and new materialist approaches her accounts are embedded in the interdisciplinary fields of childhood studies, children’s geographies, children’s environments, and environmental/nature education. The stories by children in this chapter illustrate their everyday experiences of growing up in relation with the places they inhabit: the weather, the landscape, the earth, the mountains, the dogs, and the dirt. Childhoodnature is theorized as lively, messy everyday lives, a living well with a host of others. The chapter traces the past, present, and future of environmental education and childhood studies of nature as omnipresent in complex webs. It’s littered with the intersection of stories of children growing up in a variety of “places” across the globe as the account seeks to acknowledge and trouble the view that childhoodnature does not exist without a philosophical past by tracing its theoretical ghosts. Taking a narrative approach that also follows Haraway’s (2016) call for making kin with growing awareness of a looming sixth mass extinction of species, the chapter by Duhn and Quinones focuses on multispecies encounters to consider what childhoodnature as a concept can do for research. The intention is neither to focus on what can be learned from multispecies child-animal encounters nor is it an attempt to document such encounters in “real life.” Rather, the chapter experiments with the porosity and liveliness of materialized thought (the text) as it gives form to an event (the multispecies encounter) across time and in place. The intention is to speculatively imagine a childhoodnature figuration of a hen and a child as a lively encounter that ripples through time/place and that generates unexpected lines of inquiry. The chapter experiments with a speculative approach to explore new ways of thinking and doing multispecies relationships as “earthly encounters” that matter to politics and ethics of sharing worlds. This, they argue, is an essential task in the midst of loss of diversity as it opens spaces for new imaginings about sharing worlds through kin making in childhoodnature research. Provoked by curiosity about the rise of posthuman theorizing in early years learning research and practice, the chapter by Somerville is set in the context of the Anthropocene as the age of human entanglement in the fate of the planet; it takes the view that the primary task of this time is to develop new understandings of the human and new concepts of thought (Colebrook, 2010). Early childhood has led the field of education in the development and application of posthuman theorizing in response to this imperative, prompting the explorations of the chapter. A review of the literature in this field resulted in the identification of three distinct areas of posthuman theoretical activity: new materialism, child-animal relations, and indigenous nonindigenous intersections. The third category indigenous nonindigenous intersections, which draws primarily on indigenous theorizing, was so divergent from the others, and so complex, as to be considered outside the scope of this chapter. In gathering the various papers together to make sense of the literature in each of new materialism and child-animal relations, different modes of analysis were called for. New materialism in early childhood education and practice is considered using a genealogical generational analysis following the work of Van der Tuin (2014), while child-animal relations prompted an analytical approach involving Haraway’s bag lady method following Taylor, Blaise, and Giugni (2013). A particularly interesting and curious finding was that “life” emerged as a major theme from new materialism and “death” from child-animal relations in keeping with the paradoxical nature of the Anthropocene. The chapter by Bengtsson aims to outline a theory of object-oriented learning. In this effort, it breaks with tracing nature in environmental education and education (cf. Morton 2007) in order to approach learning as relating to radical, dark ecological thought (Morton 2010, 2016). It engages in the groundbreaking work of translating the emerging ontological outlook of object-oriented ontology (Harman, 2011, 2013; Morton, 2013) into a theory of learning. This theory of learning will transgress a number of core axioms, such as the anthropocentric notions of knowledge and learning. Instead, the chapter aims to offer an outlook on learning that includes humans but does not confine learning and engagement with other objects only to humans. Accordingly, the outlined theory develops radically new perspectives on education that break with the human-world centrism of post-Kantian philosophy and offers the opportunity to a conceptualization of a widened process of learning to include also objects and inter-object relations. Learning in this object-oriented perspective becomes limited or bounded with regard to the withdrawnness of objects (Harman 2002), where we as objects have a partial sense of other objects that form a mesh in their relation to us and to other objects (Morton 2016). In this object-object relation, some qualities of objects (the sensual object) are sensible, but some remain hidden (the real object). The outline of object-oriented learning will initially embed itself within a critical analysis of philosophical underpinnings of contemporary trends within environmental education and broader education research. Amidst a growing social movement to connect children to nature, little is understood about how children actually attach to place or the role of children as nature in the shaping and theorizing of spaces and places. While place attachment is often viewed as an undertheorized concept, human attachment is well understood in traditional contemporary theories. In the chapter by Little and Derr, an exploration of human attachment provides clarity of the potential outcomes of place attachment. Human attachment and place attachment may be related concepts. Both focus on the strength of the attachment of an individual to an external entity, a caregiver, or a place in the physical environment. The secure base function of secure human attachment mirrors the home range function of place attachment. In both concepts, children venture away from the object of attachment only to return in times of stress. Yet while human attachment is well documented, the outcomes from place attachment are still being identified. Secure human attachments foster the development of an internal working model in which a child mentally organizes behavior to solicit a desired response. The strength of the model predicts the quality of future relationships. Currently no research links the development of an internal working model to place attachment. Secure human attachments also foster resilience in that children are better able to respond to and cope with stress. According to Little and Derr, secure place attachments are linked to the presence of nature, social bonding, and emotional and cognitive processes. This is consistent with emergent resilience research with children, which suggests that nature can play an important role in fostering resilience. Nature thus may be a defining feature of place attachments that help build resilience. Waite and Quay continue in this line of thinking around children’s place attachment and its relation to nature when in their chapter they present the question, (How) do places affect us? They explore how place is experienced by children with reference to empirical studies that reflect several forms of outdoor learning, both curricular and outside the classroom. Outdoor learning is undergoing a renaissance of interest and is widely seen as an effective means of connecting children to the natural world (Louv, 2005). This common conceptualization is challenged by recognizing the child within nature. In examining the question of the effect of places on young people (and vice versa), the paper employs theories of cultural density (Waite, 2013, 2015) and cultureplace (Quay, 2017) in relation to how culture informs place and pedagogies within them. It argues that the more-than-human world shapes possibilities for interaction but that these are mediated by structural and cultural influences, acknowledged and tacit, in the enactment of outdoor learning within and across countries (Malone & Waite, 2016). Interweaving sociological and psychological perspectives, the chapter considers the implications for practice and suggests that feelings and affect may act as intrapersonal organizers of this complex interplay of cultural and material influences. The authors argue that by rejecting human dominion over nature, place as “personal” is nonetheless a key contributor to the power of outdoor learning to transform lives. With the introduction of the “co-research playspace” as a methodological figure for working with children as co-researchers and co-artists in the Anthropocene, the final chapter of this section assembles objects, place, and theoretical reconfigurations to present powerful multimedia engagements with climate change. Cutter-Mackenzie and Rousell focus on collaborative research and artistic co-production with 135 children who participated in the Climate Change and Me project (2014–2017) in Northern New South Wales, Australia. Drawing on Winnicott’s concepts of “transitional space” and “transitional objects” in relation to children’s art and environmental play, they focus on the ways that iPads functioned as transitional objects within the Climate Change and Me project. This leads to further analysis which highlighted that children used digital video as a “transitional medium” to experiment with new forms of co-production and creative resistance. Through analysis of films produced by children in the project, a series of three political esthetic modes of response to climate change is outlined to break with the predominant moralistic discourse surrounding the issue: I. critical interventions in public space; II. wild, absurd, and improvisational disruptions; and III. the creation of thought experiments and alternative worlds. The chapter concludes with the consideration of “children as para-academic researchers,” a concept that emphasizes children’s abilities to invent their own modes of co-creation and critical inquiry that disrupt normative research protocols and associated adult expectations. Sections in this chapter significantly offer and contribute to ideas both of “naming” of the field and persistence with analyzing not only subjects and space/places but also “time.” Recently, Koro-Ljungberg (2015) developed a concept of “methodologies with no name,” or methodologies without methodologies. The methodology of naming is equally important as the act of naming. In the methodology of naming, we utilize the same methods: There have been attempts to colonize both children and nature through the act of naming. Through the act of naming, there is a strong seductive calling for new recipes, new ideologies, new control systems, new institutions, and new instruments, to eliminate the dreadful consequences of our prior errors of children and nature/culture binaries. Failing to name a theory or methodology can be a productive exercise which could continue the grappling with existential threats associated with the childhoodnature challenge and with the objective way out of the crisis of objectivism and the arrogant belief that all issues can be solved with new technologies and with the push of a button. Indeed, the naming of new theories is filled with complexities and potential pitfalls. The notion of urgency – and time – illustrates the paradox of the measure and the measured: time may be said to measure motion, or motion may be said to measure time, in our understanding of childhoodnature. This paradox is inherent in speculations, being and listening and deep hanging out with children, and fiction alike: the walking and the travels are measured by time, and time itself is measured by walking and being with the other. The concepts of mobility and time become pertinent in human subjects’ memory-infused narratives – in the freedom to move and explore or the freedom to work with time. Time runs slowly in the mornings and in school and disappears quickly in the afternoons. Time runs quickly with the Anthropocene and slowly with us doing something about it. Time is a continuity divided paradoxically into three parts: the past, which is a continuity but no longer exists, the future, which is a continuity but does not yet exist, and the present, the now, then moment, which exists but is discrete. And theories of childhoodnature, named or unnamed, in this section allow children in the Anthropocene to be equipped with theories. Haraway (2015) insists that if we are to imagine and nurture rich multi/species/material assemblages and new ways of being with the planet, then “we need stories (and theories) that are just big enough to gather up the complexities and keep the edges open and greedy for surprising new and old connections” (Haraway, 2015, p. 160). In this childhoodnature theoretical section, we were set the task of mapping out the possibilities for richer, more complex, yet open and greedy, theoretical frameworks for posthuman assemblages of childhoodnature. Readers are invited to consider this section as a loosely woven bag or basket, unfinished, with raw edges that invite additional weavings and threads. The function of the bag is not to carry loads from here to there as efficiently as possible. Rather, the bag poses a challenge to the ways in which we have come to think of functionality, normality, and efficiency. Many children know this: things are not what they seem to be. Theories as things, as thought objects, and as tools may benefit from a shake-up or closing or from being threaded to the raw edges of the bag in unexpected ways. This section invites readers to enter into a space where playing with theories makes childhoodnature come alive – a childhoodnature playspace. Haraway, D. (2011). SF: Science fiction, speculative fabulation, string figures, so far. Viewed Jan 30 2014. http://people.ucsc.edu/~haraway/Files/PilgrimAcceptanceHaraway.pdf. Malone, K., & Waite, S. (2016). Student outcomes and natural schooling: Pathways from evidence to impact report. Plymouth, UK: Plymouth University. Retrieved from https://www.plymouth.ac.uk/uploads/production/document/path/6/6811/Student_outcomes_and__natural_schooling_pathways_to_impact_2016.pdf. https://doi.org/10.13140/RG.2.1.3327.7681.